Within a few minutes after meeting the ‘engaging’ section of the protesters, SL President Maithiripala Sirisena, in his address at Jaffna Hindu College event, was twisting the ‘engagement’ to his favour. 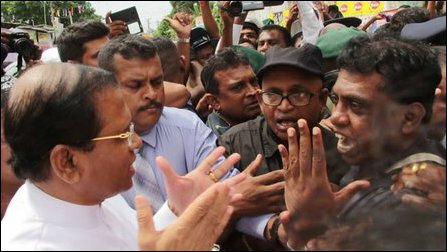 Mr Sirisena said he had got down from his vehicle and wanted to talk with the protesters about discussing the issue, but the protesters were refusing to come for a meeting to discuss the matter, he claimed. In the meantime, the 20 organisations that have been behind the successful protest on Friday are to make a decision Saturday evening regarding the deteriorating situation of the protesters and how to proceed with the protests further. The organisers of the protest move have a serious homework to do in explaining to Mr Shivajilingam and Mr Premachandran where to engage and where not to engage, commented Tamil political observers in Jaffna. TNPF Leader Gajendrakumar Ponnambalam was also highly critical of the protesters getting trapped by the ‘engagement’ politics of the SL Government, which is behaving in a racially discriminative manner on the whole affair of the Tamil political prisoners. Suresh Premachandran also said the SL Government was behaving in a racist manner and explained that SL President was only saying that he would discuss the matter without specifying anything concrete. On Friday, SL Governor Cooray was trying to score a point before the visiting UN Special Rapporteur hat he was ‘engaging’ with the protesting Tamils through two NPC members M.K. Shivajilingam (ex TNA MP), B. Gajatheepan and a former civic councillor Shangmugalingam Shageevan, who had gone to negotiate without discussing their plan with the organisers of the protest. ITAK Leader R. Sampanthan, who was scheduled to accompany SL President, backed off from the visit on Friday following the province-wide shut-down and the protest in front of the secretariat of SL Governor Reginald Cooray.